Costerfield is located 100 km north of Melbourne and the average annual rainfall is approximately 575 mm. The land is generally used for sheep grazing and the topography includes undulating rises, gentle slopes and drainage depressions (see Land Degradation near Costerfield). Prior to clearing by European settlers the landscape was ominated by Eucalyptus spp. The soils are typically duplex (i.e. strong texture contrast, sodium-affected to some degreee and are classified as Sodosols, Kurosols and Chromosols (Isbell 1996) so that they slake and disperse. A sparse cover of unimproved native grasses is evident in the photograph below. The area forms part of the Western uplands Geomorphic Region. The site characterics have been discussed elsewhere on the website (see Tunnel Hydrology near Costerfield). By establishing the nature of the semi arid climate in relation to teh chaning vegetative cover and soil disturbance, it was possible to explain the conditions surrounding the onset of tunnel initiation: i.e. how rainfall entered the subsoil in sufficient volumes to create tunnels. 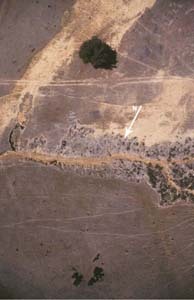 In essence, the landscape was formerly covered by a dense tree cover (as evidenced by the remnant stumps throughout), has a low carrying capacity for livestock and is characterized by low-fertility soils that are being eroded from both the surface and subsurface by sheet, rill, tunnel and gullyflow (Boucher 2002). What were the circumstances that caused the onset of such land degradation? The two operators, standing to the upper right of the large living tree, holding the tether to the weather balloon below which the camer was attached. It was possible to obtain original meteorological records to ascertain the nature of the semi-arid climate and the potential impacts it had on the changing landscape. Heathcote is the nearest Bureau of Meteorology station to Costerfield and the local newspapers were based in McIvor, as Heathcote was originally known. The various data can be used to trace a chnage in pressures imposed upon the local environment by introduced land uses. The contents of this weries of articles includes maps, survey plans, quotes and the original historical data were corroborated by newspaper reports. It should be noted that complete detailed original historical cata are often difficult to obtain owing to damage during storage since the time of collection and various other factors. 2) laying the foundations required to make inferences as to the likely timing of tunnel initiation.